Last week I shared an update on my French style home office and my latest purchase, today I was to post the reveal, however with an extremely overcast day and a few more shots to take, unfortunately I am going to have to postpone it a few more days. I know it has been a long time coming and a couple of readers have emailed me to see if they missed it. As a self confessed perfectionist, I have to have all my furniture in place, the right accessories, and the light to be just right. However, not wanting to disappoint readers, I am sharing some French style home offices today, to show how you can determine this style. It is important to remember not to over do the French look, any look for that matter. I have had to be careful in my 'small' space, I didn't want my office to look too contrived. Once my furniture was in place I felt like I wanted to rush out and buy dozens of accessories that shouted out "France!" However, to make a home office space successful and not too frilly, it is important to remember the area has to be restful as well as promote productivity so when it comes to accessories, don't over do them. 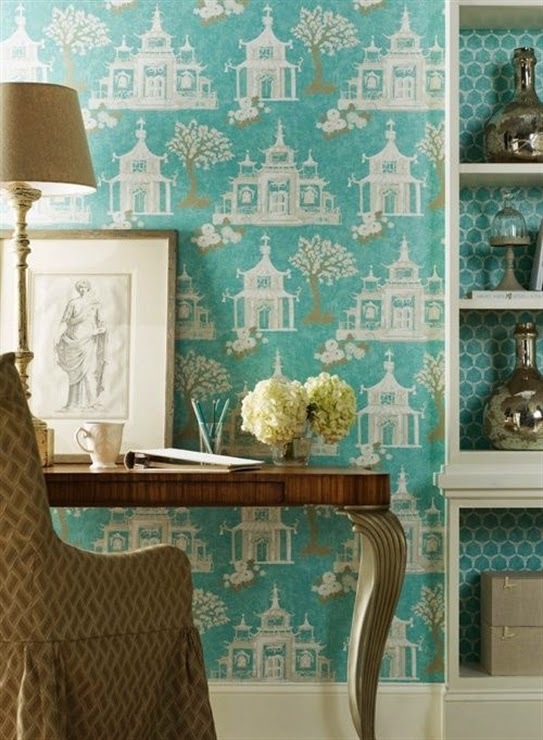 Each of the home offices below are individual in their own way, yet each have that French appeal. 2. Above: A mix of different materials keep this area interesting. A brass and glass Moroccan light is suspended from the ceiling. A contemporary metal Louis chair teams up with an English style desk which works wonderfully with the patina of the original stone floors. 3. Above: Not necessarily French but certain pieces depict the style such as the curves and carving on the arms of the chair and the delicate shape of the brass lamp-stand. 4. 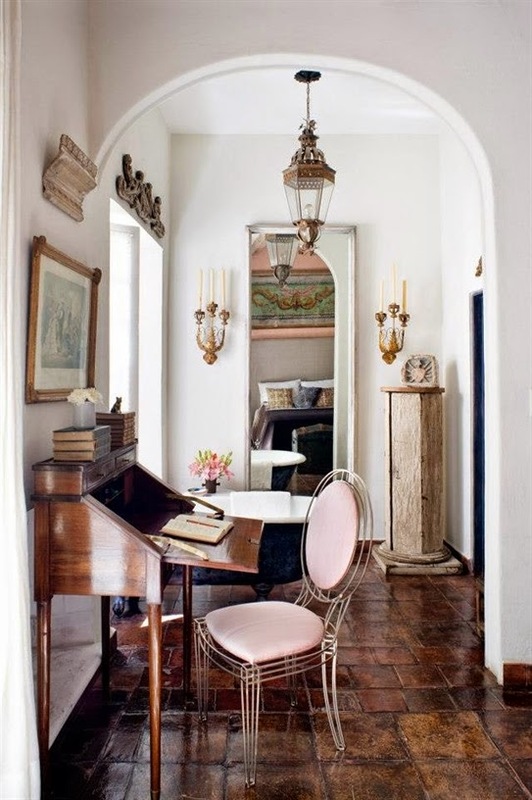 Above: I think I have featured this image before, the desk and chair are of French style. 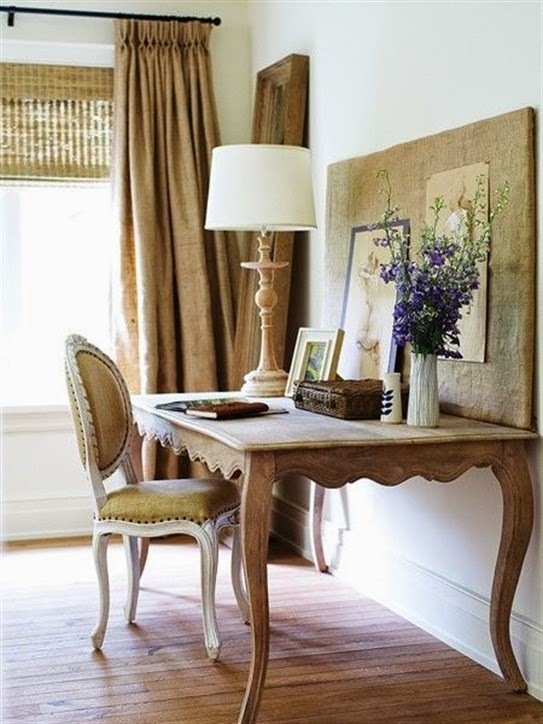 I love the depth of the desk which is actually a small table and a simple way of creating a desk. Heavy hessian/burlap curtains add texture and reflect the colours in the wood. This is an earthy French look, rustic and above all, relaxed. 6. 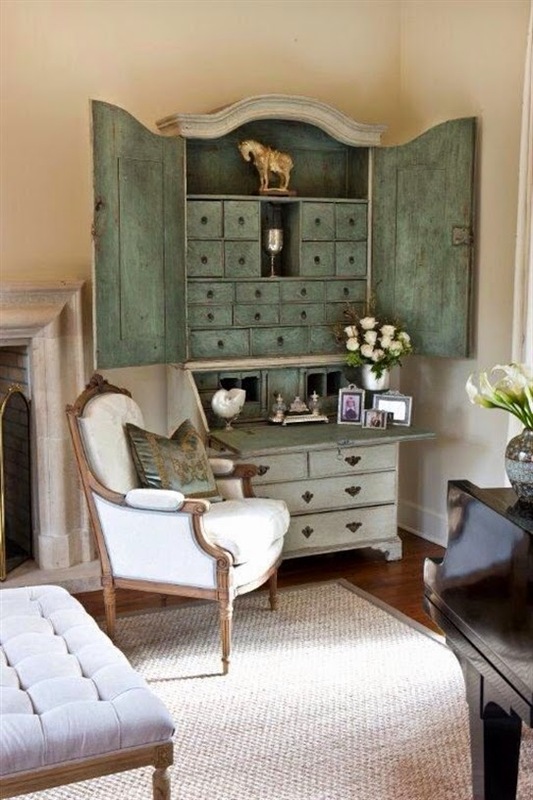 Above: A smaller secretaire is the focal point. Accessories such as the lavender and stacked books add to the finishing touches. 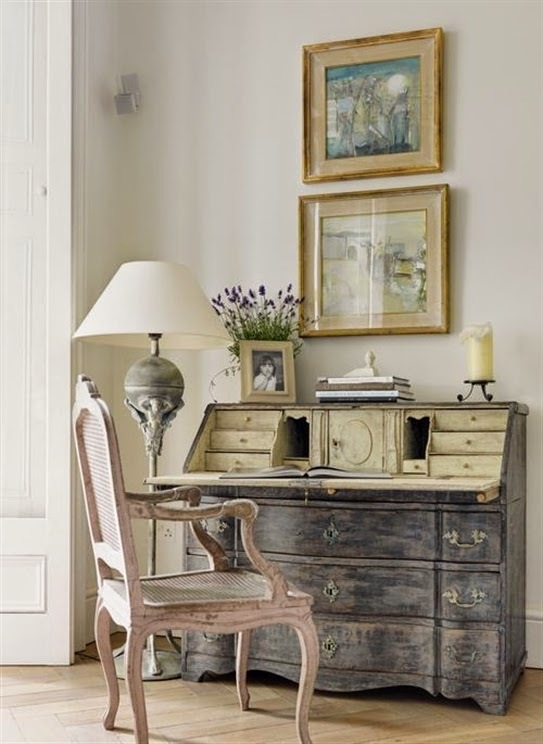 Hi Lee, love all these, specially the aqua desk, but love the rustic, Frenchiness of them too. Can't wait to see your office reveal. Thanks Jane, look forward to your comments on the reveal. Can't wait to see it! 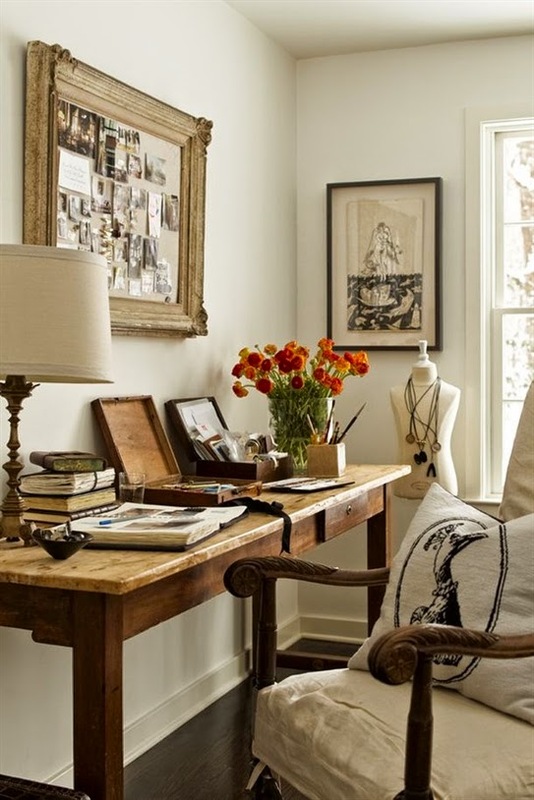 Love the gorgeous spaces ~ especially that blue desk! Looking forward to your reveal!